Again contrasting black and gold in a refined package, 2016 Panini Black Gold Football skews to the high-end. At least four of the box hits come as autographs or relics while two other hits can be metal cards, autographs or relics. All acetate PETG, the shadowbox base set includes 81 cards with 48 vets and 33 retired players. Limited parallels include one-of-one Printing Plates. Focusing on 2016 rookies, and boasting on-card signatures, Black Gold Rookie Autograph, Grand Debut AUtograph Jersey and Sizeable Signatures Rookie inserts highlight top first-year players. 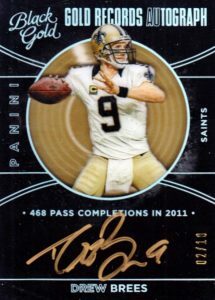 Other 2016 Panini Black Gold Football autographs include hard-signed Gold Strike and Gold Records Autographs as well as Metallic Marks, signed on metal pieces. AUtograph Jersey Prime offers on-card autographs along with a jersey swatch. Containing manufactured relics, 2016 Panini Black Gold Football also sees the return of Symbols with Quad Team Symbols and Hall of Fame Symbols. Both are numbered to 50 copies or less. Meanwhile, Massive Materials inserts work with jumbo jersey relics as well as Tag and Shield (1/1) parallels. 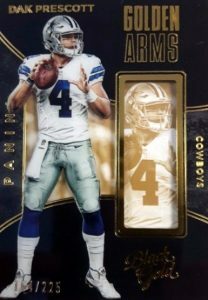 Averaging two per box, 2016 Panini Black Gold Football shadowbox inserts are numbered to 225 or less and feature new themes like Golden Hands, Golden Nuggets and Golden Rush. An earlier 2016 Panini product merges the Black Gold look with college football images. 81 cards. Serial Numbered #/225. PARALLEL CARDS: White Gold #/100, Holo White Gold #/50, Holo Gold #/25, Reverse Black Gold #/10, Printing Plates 1/1. 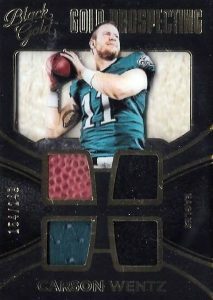 PARALLEL CARDS: Prime #/99, Tag #/5 or less, Nike Logo #/2, NFL Shield 1/1 (*No card #101). 9 cards. Serial Numbered #/225. PARALLEL CARDS: White Gold #/99, Black Gold 1/1. 18 cards. Serial Numbered #/225. PARALLEL CARDS: White Gold #/100, Holo White Gold #/50, Holo Gold #/25, Reverse Black Gold #/15. PARALLEL CARDS: White Gold #/99 or less, Black Gold 1/1. 15 cards. Serial Numbered #/225. PARALLEL CARDS: White Gold #/199, Prime #/99, White Gold Prime #/50, Super Prime 1/1. PARALLEL CARDS: White Gold #/25 or less, Black Gold 1/1. PARALLEL CARDS: White Gold #/25 or less, Black Gold 1/1 (*No card #2, 12). PARALLEL CARDS: White Gold #/99 or less, Prime #/49 or less, White Gold Prime #/5, Super Prime 1/1. PARALLEL CARDS: White Gold #/99 or less, Prime #/25 or #/10, White Gold Prime #/5, Super Prime 1/1. 17 cards. Serial Numbered #/199 or as noted. 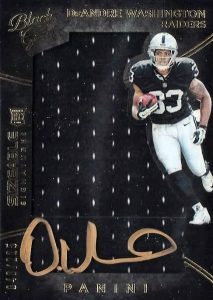 PARALLEL CARDS: Prime #/10 or #/5, Tag #/5 or less, Nike Logo #/2 (*No card #19, 30), NFL Shield 1/1. PARALLEL CARDS: White Gold #/25, Black Gold #/10, Holo Gold 1/1. PARALLEL CARDS: White Gold #/99 or less, Prime #/25 or less, White Gold Prime #/5, Super Prime 1/1. PARALLEL CARDS: White Gold #/50, Black Gold 1/1. PARALLEL CARDS: White Gold #/15, Black Gold #/10, Holo Gold 1/1. PARALLEL CARDS: White Gold #/25 or less, Black Gold #/8 or less, Holo Gold 1/1. 10 cards. Serial Numbered #/249. PARALLEL CARDS: White Gold #/149, Prime #/99, White Gold Prime #/49, Super Prime 1/1. PARALLEL CARDS: White Gold #/99 or less, Prime #/49 or less, White Gold Prime #/10 or #/5, Super Prime 1/1. PARALLEL CARDS: Prime #/25 or less, Super Prime 1/1 (*No card #6, 11, 12). PARALLEL CARDS: Prime #/49 or less, White Gold #/49 or less, White Gold Prime #/10 or less, Super Prime 1/1 (*No card #2). Real sharp design, nice rookies, vet autos look great. I enjoy this product. Great cards, but what does the description above regarding the sizeable sigs mean when it says not card #101? I have that card. I got the Cooper Rams Sizable sigs card so I know it exists. It means there was no listed NFL Shield parallel for Cooper in the checklist. That is why the note is only next to that one parallel. Can somebody please give me your opinion on the best break for the 2016 class..
I’d like to buy a case of either select, encased, or black and gold…any suggestions? Comments? love black gold, good design i like the feel of the cards. is panini done making this or did i miss 2017 black gold???? Used to collect cards heavily about ten years ago but quit as the market seemed to be flooded and value just wasn’t there with the crazy price points. Recently thought it was be fun to buy a couple boxes including one of these as I’m a huge Cowboys fan…now I remember why I stopped. The design of the cards are great, really like them…but wow I got absolute trash for spending $200. The auto patch I got was Keenan Reynolds…it’s a beautiful patch/card but wow it floors me that they really would include a late 6th round draft pick that 99/100 times is going to be out of the league in two years. So frustrating to spend $200 and the “major hit” is from a guy who I don’t think took a single snap in the NFL and played at the f**** Naval Academy.